One week after the thrills and spills of the Aintree Grand National, punters are now trying to solve the puzzle of what will win the Scottish Grand National at Ayr. 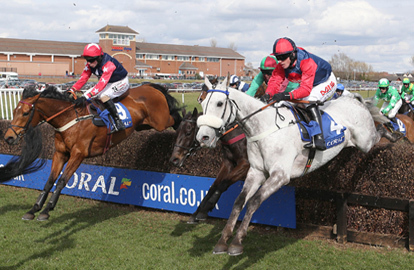 The race does not have the enormous fences of Aintree but, at just in excess of four miles, it still requires a horse with almost limitless stamina to win the race. Bookmakers are struggling to find a clear favourite from this maximum field of 32 runners. The presence of top weight Tidal Bay means that all bar eleven of the runners are out of the handicap and therefore running off a higher mark than their official rating. Green Flag sneaks in with just 10st 2lb to carry and is among for the favourites for Scottish trainer Lucinda Russell. The son of Milan is still a novice, although he has won three races this season and was fourth to Holywell at the Cheltenham festival. The winner has since gone on to beat the RSA Chase winner convincingly at Aintree so the form looks solid. Sam Winner was fifth in the RSA Chase, running a little below his best after running second to Smad Place at Newbury. His cause is greatly helped by the presence of his stable companion Tidal Bay as he only has 10st 7lb on his back and looks good value at 10-1 with Bet365. He holds Mendip Express on Newbury form, although Harry Fry’s gelding missed the big festival meetings to run here. Roalco De Farges is 7lbs out of the handicap but represents the in-form combination of Philip Hobbs and Richard Johnson. The grey is still up 13lbs for his Newbury win as a result and may struggle to follow up. Rigadin De Beauchene won the Haydock Grand National Trial in desperate ground last time out for Venetia Williams. He pulled up in this race 12 months ago on similar ground and his best form does seem to be on soft or heavy ground. Nicky Henderson must wait another year for Grand National glory after drawing a blank with his four runners last Saturday. He is doubly represented here with the enigmatic Hadrian’s Approach and the veteran Roberto Goldback. Hadrian’s Approach faded out tamely at the Cheltenham festival and his best form has come in small fields while Roberto Goldback has not won since 2012. Battle Group held up the start at Aintree last week and his form figures now read 1st, pulled up, refused, pulled up, refused. While he is undoubtedly talented, he is clearly not one to be trusted. Godsmejudge won this race last year for Alan King but is without regular partner Wayne Hutchinson through injury. Aidan Coleman is a more than capable deputy and he could go well if you forgive him his most recent outings when the stable was under a cloud. Merry King is another difficult customer who would have a great chance on his best form. Jonjo O’Neill has tried various forms of headgear on the seven-year-old without success but this race might suit him. Lucinda Russell, trainer of Green Flag, also has each-way claims with Lie Forrit and Nuts N Bolts despite being out of the handicap. The dark horse of the race could be Yes Tom who seemed to produce dramatic improvement when running away with a minor event in Ireland last time. He is a course winner and has been well backed in the ante-post market in recent days.